Assignment: Produce a package design set for a drink product of your choice. Project includes 3 package designs that function individually but also as a cohesive and designed brand. All original vector based imagery. Create a package design/3-D solution. Create a design solution using all original elements/illustration. Formulate multiple solutions to one design problem. Do some research: Find 10 packaging designs that inspire you (online, in a store, etc.) Compile images (see below) and save them in one PDF to be turned in with your final product. During this critique, I’d like to go a different direction to accommodate the commercial direction of this project. The critique will be a business setting where you are “pitching” the idea to us. Sell us your product. Why is this design superb? Who is your target audience and why would I want to purchase your product over any other product in the same beverage category? Questions to ask yourself: How can I get this product to jump off the shelves by still using the standard Principles of Design? How can I design something that is not only graphically interesting but communicates the product functionally? Critique and Design Pitch: tentative: Oct. 22/29. Dress professionally. Today’s goals: finish Family of Characters. Intro Package. Critique next week + time to brainstorm and plan. Another good one + adding to the swatches panel. Additional video – 4 min. Work in one direction – don’t change directions mid-drawing. Keep the handles of your curves pointing in the direction you are drawing. If they point backwards, you will get nasty (or perhaps useful) bumps and squiggles. Always work with closed paths. No matter how skinny the line. * note that lines created with the line tool should also be converted to paths/outlines before artwork is handed off to anyone. This is because lines tend to scale (get thicker or thinner) when artwork is scaled. Check the scaling preferences in Edit > Preferences. A single click will make a corner point. This has no handles. A click’n’drag will make a curve point. This has handles. When tracing artwork, always put the artwork on a locked layer. It is usually best to use a semi-transparent colour to trace with, rather than a line. The thickness of the line can obscure the actual path. Aim to create as few points as necessary. Once you have made a path, you will probably want to go back and fix it in places. Use the white arrow (A) to move points. Hold Alt and click’n’drag on an existing point to give it new handles. Great if you want to add or adjust a curve. Hold Alt and single click on an existing point to remove handles. Good if you want to remove a curve. Sometimes it’s useful to adjust both handles of a point at once (i.e., adjust the curve on both sides of the point). Use the white arrow (A) to do this. Other times you only want to adjust the handle on one side of a point (i.e., adjust the curve on one side of a point). Use the chevron tool to do this. To access the chevron tool you need to have the pen tool in use (P). Hold down the Alt key and a little > shape will appear, tilted, next to your cursor. Use that to grab the handle you want to change. * Note: if the point you want to change is an extrema point, remember to also hold the Shift key to retain perfect 90° lines. *Note: To cut a shape out of another shape, you need to be working only with closed paths. Open paths, text and lines will NOT work. The bottom left icon (Divide) will cut or punch a shape out of another shape, much like a cookie cutter cuts out a shape from dough. The dough should preferably be at the bottom. Stack two closed-path-objects over top of each other. They can overlap completely, or partially. 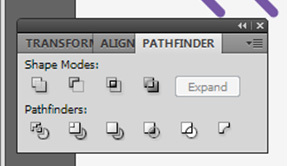 With both paths selected, click the Divide icon. Your shapes will now be cut, but they will be grouped. Ungroup the shapes. Ctrl + Shift + G to ungroup. The top left icon (Unite) will join two closed paths together. Same step one as above, then click Unit icon. That’s it, you now have a single path from what used to be two or more separate paths. 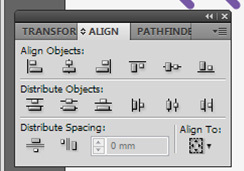 You should be able to work out the basic “align-left” “align centre, and “align top” tools easily enough. *Note: Before aligning or distributing anything, always check what you are aligning stuff to. See the icon in the bottom left. Usually you want to align to selection (things you have selected on the page), but sometimes you may want to align stuff to the page. You have two choices with the Distribute tools, you can either distribute centres, or distribute spaces. Distribute centres is great when all your objects are the same dimension (i.e. same width if you plan to distribute horizontally). It is a pain if you have objects of different dimensions though; then it just makes a mess. That is where distribute spaces comes in handy. It makes the space between all the objects you have selected even. A good example is text (turned to outlines), which are often varied widths.